Previously on Supergirl: Kara Danvers was adorable and great. Alex Danvers was really cool. J’onn J’onzz basically adopted the Danvers sisters and they’re an awesome crime-fighting family. Winn was kind of creepy and annoying but he improved. James Olson and Kara had heart eyes for each other. Heroics! Friendship! Saving the world! Hurrah! It’s all very fluffy and wonderful and I’m not saying that the bright and shiny Earth on which Kara lives is my favorite of all the DC TV show worlds, except that I totally am saying that because all I know is that Kara would probably think twice before ruining an entire timeline. That makes her a winner in my book. The channels for Supergirl may have changed, but the premiere starts right where we left off in the plot. Kara and her pals are celebrating a night of heroing when they’re interrupted by a fiery crash outside. When Kara goes to check it out and finds a spaceship similar to the one that sent her to Earth, she’s curious as to what might be inside. I suspected anything from a Kryptonian dog to a flying horse that is actually a shapeshifting centaur. Instead, it’s a dude. I mean, it’s probably a Kryptonian dude, but still. Just a dude. Bizarrely, after this comatose probably-Kryptonian is introduced (having fulfilled his role as Cliffhanger Bridge) he’s pretty much forgotten about for the rest of the episode. Kara and J’onn head to the DEO, which is not the usual DEO (thanks for the new set, CW!) but a shiny, official-looking building. Kara is understandably confused by this (“Wait, this has always been here — with the glass and the views, and you made me fly to that cave everyday? !”) but the focus is, for now, on the new guy. Kara thinks he must be Kryptonian. Everyone else would rather investigate and reach a more sure conclusion. They get Winn to handle the investigation, because he needed something to do this episode, I guess. That’s it for the space dude! Kara gets called into work by Cat, even though she’s no longer Cat’s assistant, and we get the main plot for the “normal” side of Kara’s dual existence: Cat wants her to pick a new career. Because Cat’s the absolute best life coach, she wants Kara to take finding a calling very seriously. The other part of the normal-life side of the episode is Kara’s budding romance with James, but we’ll visit that later in the review. Meanwhile, a shuttle holding a bunch of billionaires launches and then immediately starts to crash. This looks like a job for Supergirl! And also Superman. I was kind of worried about how Supergirl was going to handle the Superman introduction, but I’m happy to say that they did an excellent job with it. 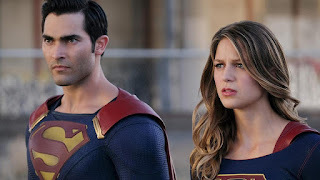 Clark/Superman as a character neither overshadows Kara nor lords his experience over her, and although the show does give Superman a pretty grand introduction (it’s mostly in the music) they correct it by having him happily team up with Kara immediately. Both characters just seem happy being around each other and working together. It’s lovely. Clark’s sticking around because it turns out that Lena Luthor, adoptive sister of Superman arch-nemesis Lex Luthor, was the intended target of the shuttle explosion and evidently has a hit out on her. Presumably, Lex is the one trying to kill her through an evil British guy named Corben — perhaps because Lena’s trying her hardest to erase Lex’s legacy by renaming the LutherCorp company, perhaps because of some other nefarious reason. Either way, I’m pretty sure Lena Luthor isn’t as good as she seems to be, though Clark not only writes a great article about how Lena survived various murder attempts and even shot one of the people trying to kill her, but also apologizes for judging her based off her Luthor name. He and Kara seem to be on Team Lena. So am I, but only because she’s played by Katie McGrath from Merlin and I’ve missed her smirks. This was a really solid, entertaining season premiere. Kara and Clark are a fantastic superhero-cousin duo, and I really loved the little touches that showed not only their familial bond, but a shared history (Kara teasing that she used to change Superman’s diapers, for example). The A-plot involving protecting Lena Luthor from attempts on her life was a good way to not only introduce her as a character, but also introduce what I assume will be a season-long story arc involving her. As ever, the show tries mirroring the events of Kara’s life as Supergirl with her life as Kara Danvers: in this case, it was all about her ability to balance her lives well and be her ideal self in both. Unfortunately, this whole life-balancing stuff is where the episode got a little shaky. I’ve never thought Supergirl wrote romance very well. Between the weirdness of Winn’s Friend Zone whining (which actually made Kara cry and feel guilty in an episode, despite the fact that nothing about Winn’s sense of romantic entitlement was in any way her fault) and the clumsy gravitational orbit that has been going with Kara and James, there has never been a romantic subplot on this show that was handled with anything approaching finesse. This episode continues that losing streak with a “wait, what?” moment in which Kara decides that she doesn’t actually like James romantically at all. She doesn’t even want to go on one date with him just to see. Because, yeah, she’s had a crush on him since she first saw him but nope! Now that they’re both available for some mutual face-mashing, Kara’s diving off the Love Boat. Here’s what’s up: I’ve seen a lot of television, and there is no way that this is the ending of Kara/James. If it is, it’s bad writing. If it’s not, and it’s what I think it is (i.e., a lazy grab at drama with some Romantic Angst that goes on too long and feels contrived), it’s also bad writing. Either way, there is one conclusion to be made and that conclusion is that the Supergirl writers are really bad at romance. I think a lot of the problems here have to do with the myth that couples in shows can’t actually get together and still be interesting. Jenn talked about this a bit in her wonderful post about the Moonlighting Curse, and even though I don’t think this exactly what Supergirl has going on, I do think there are elements of that fear in this show. They wonder how they can keep the romantic subplot interesting if they just have the characters get together and stay together. They wonder if getting them together makes the show too much about two people in a relationship and not enough about a super-powered alien stopping space shuttle explosions. They arrive at the conclusion that this is how romance has been written in dramas for ages, and they decide to just stick with it. Even though it’s boring because it’s the same thing that’s been done for ages. Sigh. 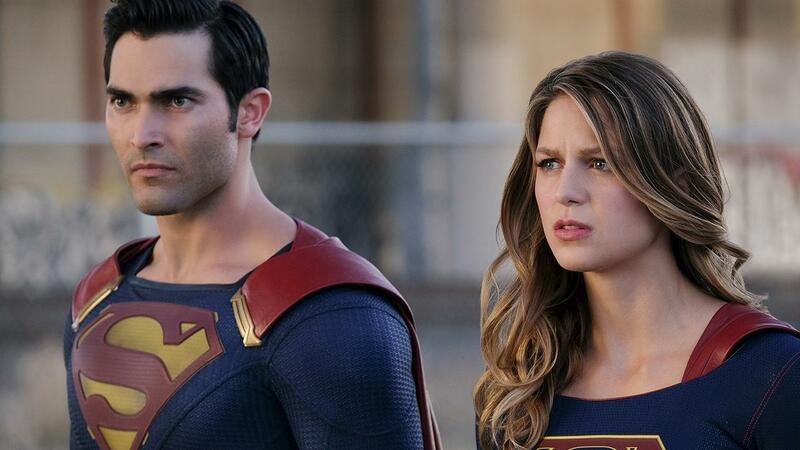 Hopefully, whatever’s going on with the irritating romantic subplot on this show doesn’t distract too much from the fun of Kara being sunshine incarnate and saving the world a lot. “The DEO has several facilities, Kara.” “A bat bit me in the last one.” “Whiner.” I love J’onn a lot. I love Kara introducing Superman to people like they're at a cocktail party and he's new in town. If someone could please explain the whole Kryptonian Aging thing they kept mentioning during this episode, I’d appreciate it. "She actually sent him a drunk text once. It was... it was florid." What does that even mean, James? Clark on the phone with Lois was so freaking cute. “We’re moving back to Gotham.” There is no way that Gotham is safer, dude. Oh yeah, there’s a subplot where J’onn and Superman hate each other and I’m not really sure why it exists but maybe it’ll become useful later on, I don’t know. Speaking of subplots: Kara’s vocation quest leads her to becoming a reporter. So many superhero reporters! Honestly the worst thing about the Kara/James situation is Mehcad Brooks’s expressions. He plays James as absolutely head-over-heels for Kara and subtly heartbroken when she tells him she just wants to be friends.